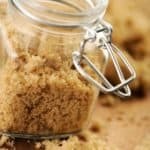 This brown sugar body scrub is made with almond oil and moisturizes as it removes dry skin. Add the brown sugar, almond oil, Vitamin E oil, and vanilla extract to a bowl. To use: Apply sugar scrub to wet skin. Massage the scrub into your skin and then rinse off with water.